Owners of a factory in China where 10 workers have killed themselves say they will no longer make condolence payments to employees who take their own lives except those that are mandatory. 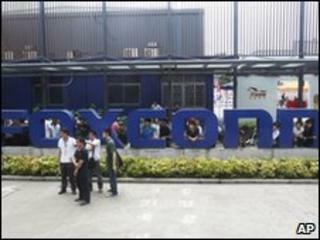 Foxconn has been paying compensation equivalent to 10 years' wages to the families of suicide victims. Posters have gone up at the factory site in Shenzhen to explain the move. They say that to prevent more tragedies Foxconn will not pay compensation beyond its legal obligations. Previously most of the victims' families had received payments of more than $14,000 (£9,700) each. Foxconn officials say they have evidence that in at least one case where a worker attempted suicide, he told his family they would receive a large amount in compensation if he took his own life. Terry Gou, the Taiwanese chairman of the electronics company's parent firm, has announced that an investigation by the Chinese authorities found that none of the suicides were related to working conditions at the Shenzhen plant. Mr Gou says the fact that he was not detained after the investigation "proves" the company should not be blamed.